Japanese animation Detective Conan is a reasoning animation; it is really an ordeal to audiences’ IQ, audiences will enter into the world of reasoning following the leading character. Everyone knows that Conan is a very smart pupil, and it is nothing difficult to deal with all kinds of bad people. Can he deal with those adults easily only by the body of a pupil? Obviously not, he needs more skills and various magical props invented by Dr. Ali as the supplements. Conan’s magic props are countless. Today, let’s take a look at the nine magic props of Conan. All the props are very practical. First, press the button (that is the knob used by ordinary watches to adjust the time), and the cover will stand up. Secondly, target the body (usually the neck) of the anesthetized person with the aiming center of the cover’s sighting device. 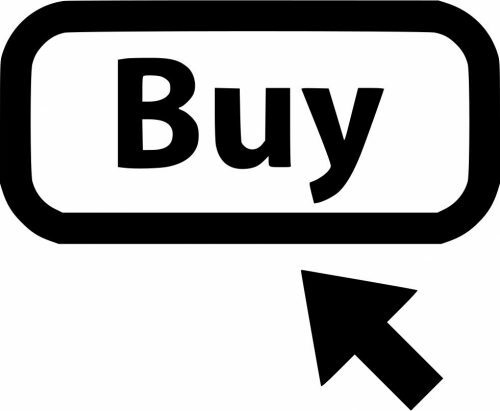 Finally, by pressing the button, an anesthetic needle can be sent out, which can make people be instantly anesthetized. Later, in M17 Private Eye in the Distant Sea, satellite phone and USB socket were added to the watch to improve its function. Generally speaking, once Conan had the idea of launching, few people could escape the fate of being shot. Richard Moore was often shot by the watch. In addition, Conan’s watch also has the function of flashlight; by adjusting the knob of the watch, it can emit light like a flashlight from the text disk of the watch. The Voice-Changing Bow-Tie is one of Conan’s powerful props. The inner knob is used to adjust and change the sound freely. The right knob adjusts the interval and the left knob adjusts the volume. It is one of the most commonly used props of Conan. It used to changed to many voices of characters, such as Richard Moore’s voice is No. 59, Conan’s voice is No. 67, Rachel Moore’s voice is No. 24 and so on. Its effect is very practical. The principle of Power Assisted Kick Shoes is to stimulate the foot acupoints by electric and magnetic force, so that the strength of muscles can be maximized. Through the right knob adjustment, it has three different forces; this pair of shoes had made many contributions for Conan. Conan also used this pair of shoes to kick down several big trees in the school; the power of this pair of shoes can also be evident. It is the best prop for Conan to control those criminals. It is the prop of the Detective Boys. 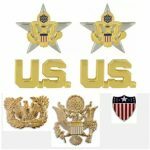 Each member has one badge, which can talk to each other, and the structure is very precise. Its main colors are yellow, blue and gray. It is equipped with a transmitter. As long as the radios of the badges are tuned to the same frequency; the voice of other owners can be heard. If you press the call button on the Detective Boys Badges, you can also talk to others, which are really useful at the critical moments. A new super skateboard is Conan’s best vehicle. It’s small, light, easily to carry. In addition, Conan is a good skateboarder; he can use it like a fish in water. The skateboard is equipped with a high-performance solar engine, powered by solar light. Its maximum speed is determined by the solar energy, about 80 km/h. It can be used in the manhunt process of criminals. It is designed to increase Conan’s maneuvering force. This is not an ordinary pair of glasses; it has both tracking function and eavesdropping function. The eavesdropper was located on the right; the earphone is on the left. A transmitter which looks like a sticker was put on the left lens, turn on the device. Signals can be received within 20 kilometers. The targets within the scope are visible on Conan’s lens. But as same as the mobile phones, its power will be exhausted and need to be recharged. Its prototype is the glasses worn by the author. It’s an earring style phone. The number button area and the voice collector are on its back, and it is connected with a small earphone. Wearing the earphone, people can use the collector and earphone to talk to others. When connecting with a Voice-Changing Bow-Tie, it can be used to voice-changing communication with people. Due to the continuous popularity and upgrading of mobile phones in the real world, this prop has gradually faded out in the Conan world. It looks like a pair of cufflinks, but it’s actually an eavesdropper. Put on the cuff, it’s not easy to be found out. It’s very small and can be stuffed in through the gap of the door. It’s also easy to be carried and can be used to eavesdrop in conjunction with the earphone of the Criminal Locator Glasses. In M9 Strategy above the Depths, the Custom Cufflinks also has a sound amplification function which can amplify the sound by radio. 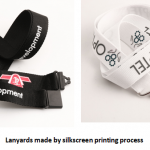 This suspender can stretch freely and drag heavy objects. It is usually tied to the body as a strap. The elastic suspender is made of special shaped memory material fibers. Tie the both ends of the suspender to the heavy objects, press the button in the center of the suspender, then the slings begin to stretch to lift the heavy. This prop is designed to make up for Conan’s shortage of arm strength. Above are top 9 magical props of Conan, they are all very practical! In fact, Dr. Hershel Agasa has made many inventions for Conan. The body of a child, with a high intelligence quotient mind; with the use of various magical props, Conan just likes a tiger with wings added. Conan’s ability is more than that; he also has many other strong points; that’s why so many people like Conan. 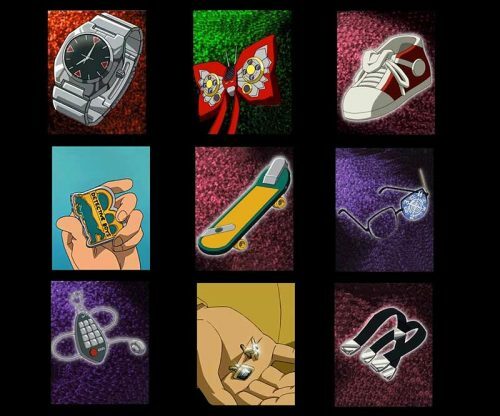 Do you know any other magical props in Detective Conan? 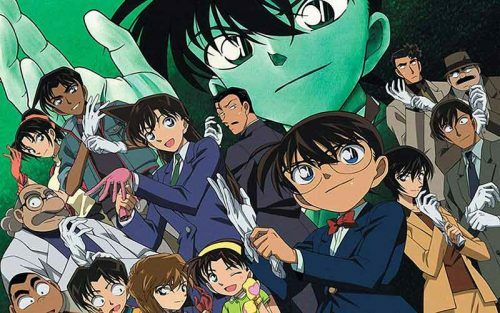 Welcome to write to us in the comments section to discuss with other fans who like Detective Conan. 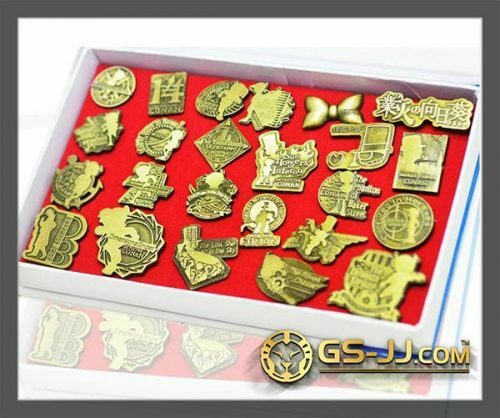 By the way, if you want to create your unique prop custom pins for Detective Conan, contact GS-JJ as soon as possible. With the advantages of high quality and factory cheap price, the professional custom pins maker with 20 years experience will be your best choice!